I have been keeping an on-line journal, but find that I am writing the entries in the form of letters to someone that I have lost and can't seem to get over. This journaling does help me to see things in a new light when they are in front of me in black and white; but what I am wondering is: Is my writing to this person part of the reason I can't let him go? 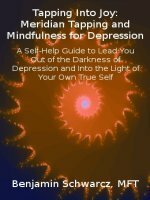 I have tried Tapping and Meditation both for this particular loss, and it's the one thing they don't seem to help. I try to switch my journaling to writing to myself, just jotting things down, whatever; but it always becomes a letter to this person. I have GOT to find a way to move on and let his memory go, or at least not to feel such pain and loss when I think of him. Do you think it will help if I stop journaling for awhile? I will continue the Tapping. Yes, I think if you are always journaling as if writing to this person, you are making it much harder to let them go. If tapping is not working for this loss, it's likely that there is some "aspect" of the loss, perhaps an unacknowledged emotion about him, or about the loss, that needs to be included in your tapping sequence. Guilt and anger are often aspects that are unconscious in us, and those feelings may need to be addressed in order to really let go. I also suggest doing multiple rounds, sort of free-associating, while tapping; don't think too hard. Close your eyes, and see what new insights might come up around this loss. But to answer your main question - maybe back off of the journaling, (or even take a break for a while) or discipline yourself to not write to him if this is possible.